The Guardians of the Galaxy Space Station Challenge uses Rocket and Groot as inspiration for student space science experiments on the International Space Station. Two of the Guardians of the Galaxy are crossing over to the real space station to engage teens in science. Rocket and Groot, characters from the Marvel comic book franchise, are taking sides in a competition that challenges students to propose microgravity science and technology investigations based on the talking raccoon's and tree-like creature's respective attributes. Two of the submitted ideas will be chosen to launch to the International Space Station (ISS), where they will be performed inside the U.S. National Lab later this year. "[This] is a great way to bridge the comic book community with the space community to advance science, technology, engineering and math education," Kenneth Shields, CASIS Director of Operations and Educational Opportunities, said in a statement announcing the competition on Wednesday (Jan. 10). "Rocket and Groot have characteristics that are researched onboard the ISS daily, and to allow students to propose experiments based on their favorite superheroes will be an exciting way to engage our nation's youth about STEM principles and the space station." "The Guardians of the Galaxy" Groot and Rocket Raccoon were depicted on a 2016 mission patch representing U.S. National Lab research. This is Rocket and Groot's second crossover with CASIS and the International Space Station. In 2016, the duo were featured on a mission patch representing all of the science that was launched to the U.S. National Lab that year. The patch, which in its embroidered form was also flown to the space station, depicted Rocket and Groot looking up at the orbiting outpost in the night sky. For this new contest, students are invited to pick between "Team Rocket" or "Team Groot," representing two separate research opportunities. Students joining Team Rocket are challenged to suggest concepts inspired by Rocket Raccoon's ability to improvise as a "starship pilot, military tactician, technological genius and leader." These flight ideas are focused on technology development and materials innovation, such as developing satellite technology to be deployed from the space station or evaluating metal alloys in microgravity. 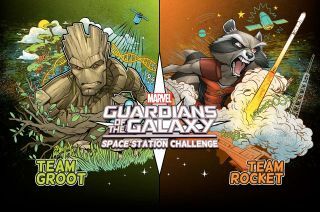 Students joining Team Groot and Team Rocket in the Guardians of the Galaxy Space Station Challenge will propose ideas based on the characters' respective attributes. Students interested in biological and regenerative science can align with Team Groot. Experiments modeled after the plant-based superhero could include growing crops on the station as a potential food source for future astronauts or studying the gene expression of space-exposed seeds. Team Groot payloads will need to fit in a CubeLab, a self-contained 4-inch (10 centimeters) square provided by the space services company Space Tango. Concepts for Team Rocket must fit in the similarly sized NanoRacks NanoLab, which includes a circuit board to activate the experiment. The competition is open through Jan. 31. Entrants need to describe their idea and explain why performing it in space will enhance their findings. The contest is open to students in the United States between the ages of 13 and 18. After the contest concludes, CASIS will choose two of the submitted concepts to turn into reality, launching them to the space station this year. For more information or to enter, see the Guardians of the Galaxy Space Station Challenge website at spacestationexplorers.org/marvel.